Remember… Only You Can Prevent Forest Fires! Smokey Bear was created in 1944 to be the mascot for fire prevention. He starred in an advertising campaign for the US Department of Agriculture Forest Service. The need for a fire prevention campaign came about in the years of World War II. In 1942, a Japanese submarine fired shells onto the oil field near Santa Barbara, CA. A few of the shells exploded inland, and the country became afraid of more enemy attacks reaching further inland to the forests. America also needed timber for the war effort, and 22 million acres of forest were being destroyed by fire each year, most of which were accidental. Since many of America’s men were not available to fight fires due to the war, the idea to launch a fire prevention campaign was born. 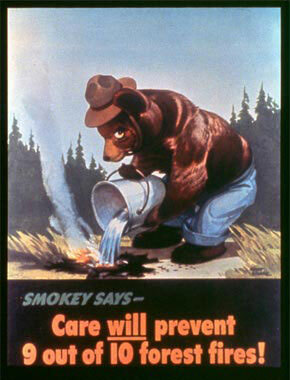 Smokey Bear’s first poster was revealed August 9, 1944. The Wartime Advertising Council and the Forest Service paired up to create the Cooperative Forest Fire Prevention Campaign. Originally, Bambi was on the fire prevention posters as the mascot, but Disney had only approved his use for one year. Smokey’s first poster, drawn by Albert Staehle, shows Smokey, wearing blue jeans and a ranger hat, putting out campfires with buckets of water. His next poster, drawn by Rudy Wendelin, shows Smokey wearing blue jeans, a ranger hat, and carrying a shovel. 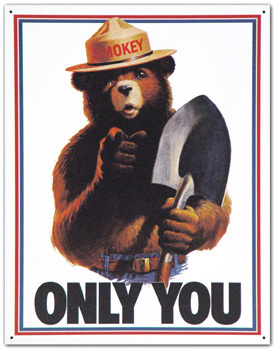 His famous slogan, “Remember… Only You Can Prevent Forest Fires!” was added in 1947. In 1950, a black bear cub was rescued from a huge wildfire in New Mexico. He had climbed a tree to escape the fire, though he did receive bad burns on his legs and paws. After being treated, the bear cub was sent to the National Zoo in Washington, DC. The story of this bear was broadcast nationally, and he was associated with Smokey Bear, thereby strengthening the campaign against wild fires. In 1952, Steve Nelson and Jack Rollins wrote a song called “Smokey the Bear” that began a debate over Smokey’s name. Officially, his name is Smokey Bear, but many people refer to him as “Smokey the Bear”. The song contributed to the popularity of Smokey, and he began to attract commercial interest. An act of congress passed a law to take Smokey Bear out of the public domain and put him under the care of the Secretary of Agriculture. This allowed any royalties collected to be used in the educational campaign for forest fire prevention. In the ’50s and ’60s, the Ad Council sponsored several radio ads starring Smokey and celebrities of the day, such as Bing Crosby, Dinah Shore and Roy Rogers. Smokey also starred in television commercials and comic books, and he made personal appearances. Smokey’s popularity was so great that other merchandise was produced. There were stamps and books for children, calendars, Smokey Bear figures and dolls, and even a Smokey board game! The Smokey Bear educational campaign is the longest running public service campaign in history. Smokey’s famous look has not changed much over the years, but his slogan was updated in 2001 to “Only You Can Prevent Wildfires!” (removing the Remember…). Since the creation of the fire prevention campaign, the number of acres burned by fire each year has gone from 22 million to 4 million. Generations have grown up listening to the wise words of Smokey Bear, and he will continue to be an educational figure in America for many years to come. Do you remember Smokey Bear when you were a kid? Did he leave an impression?